Our Sound of Music Tour is offered only as a private tour and designed exclusively for those who are staying in (or starting in) Berchtesgaden. 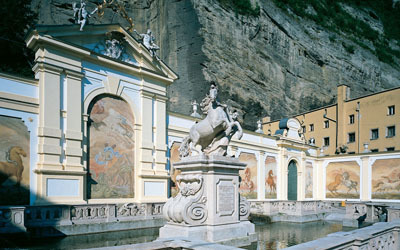 This delightful tour combines Salzburg’s history and architecture with the main locations used in the film. 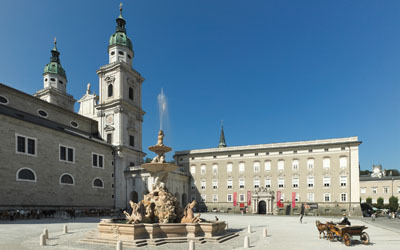 This unique tour is conducted by native English speaking Sound of Music authorities who can tell “behind-the-scenes” stories about this film classic. En route from Berchtesgaden to Salzburg your guide will recount Berchtesgaden’s role in the filming of the Sound of Music and describe the sites that were used in this area. 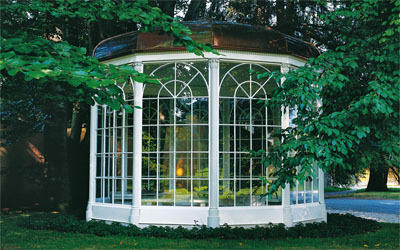 Once in Austria, the guide will touch upon Salzburg’s fascinating history before making a stop at Hellbrunn Palace where the famous “gazebo” used in the movie is located today. You will drive by Frohenburg Palace (used as the front of the von Trapp home in the film) and stop at Leopoldskron Palace (which portrayed the back of the von Trapp home in the film). Following your pleasant stroll through town, you’ll enjoy an hour free time in Salzburg before returning to Berchtesgaden. 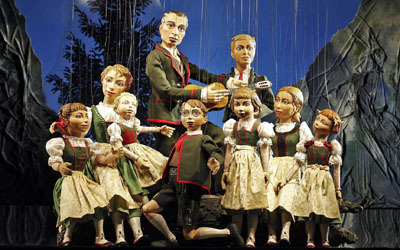 On the way back from Salzburg to Berchtesgaden your guide will recount the true story of the von Trapp family and how it was made into a film classic, still so popular today. Songs from the film will be played during the driving tour, setting the tone for a memorable morning. The price of a driver/guide with air-conditioned van is EUR 250 (which seats up to 4 passengers) or EUR 300 with mini-bus (which seats up to 8 passengers) for a half day tour. The tour departs at 8:30 am from the Berchtesgaden Germany tourist office (we also can pick-up guests from their hotel if it is located in the Berchtesgaden area). Just like our half-day Sound of Music Tour, our fan tour is conducted by native English-speaking Sound of Music experts who can tell “behind-the-scenes” stories about the making of the film. You, the customer, tailor this exclusive tour according to which film locations you find the most important. Offered only as a private excursion, the Sound of Music Fan Tour can last from 5 to 8 hours, depending on the chosen sights. As with the four-hour tour, our Sound of Music Fan Tour is NOT suitable for customers who are staying in Salzburg or who have already visited Salzburg’s old town: it begins and ends in Berchtesgaden, Germany, only. En route from Berchtesgaden to Salzburg your guide will explain Berchtesgaden’s role in the filming of the Sound of Music and describe the sites that were used in this area. 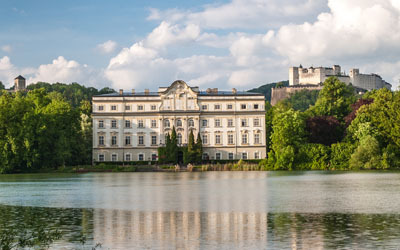 Once in Austria the guide will touch upon Salzburg’s fascinating history before making a stop at Hellbrunn Palace where the famous “gazebo” used in the movie is located today. You will drive by Frohenburg Palace (used as the front of the von Trapp home in the film) and stop at Leopoldskron Palace (which portrayed the back of the von Trapp home in the film). The price of a driver/guide with air-conditioned van is EUR 250 (which seats up to 4 passengers) or EUR 300 with mini-bus (which seats up to 8 passengers) for up to 4 hours and EUR 50 for each additional hour. The tour departs at 8:30 am from the Berchtesgaden Germany tourist office (we also can pick-up guests from their hotel if it is located in the Berchtesgaden area).